How to keep pure maple syrup. After opening the container, keep in the refrigerator if possible. Should the syrup start to ferment or have mold apperar on top of the container, do not be alarmed. Skim off mold and heat syrup to the boiling point immediately. In most cases this will restore the syrup to good flavor. The flavor of syrup that has been kept for a long time can often be restored by heating. Won Wisconsin Blue Ribbons every year entered. 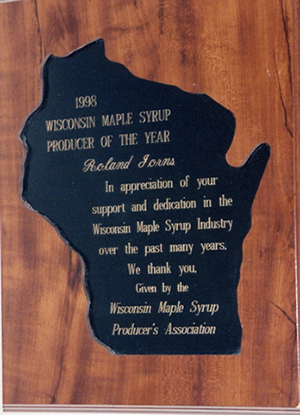 Wisconsin Maple Syrup Association Inc.
Wisconsin Maple Producer of the Year 1998.